Hey kids, what time is it? This friendly little girl clock is a fun project for any child’s room. Pictured made from pine, this project can be displayed on the wall or on a shelf. All plans drawn FULL SIZE. Measures 18" high. (This clock is a companion project to our #W3389 (little boy) Kid's Pendulum Clock sold separately. 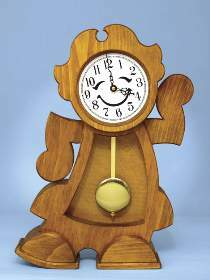 Order one #3189 Kid’s Pendulum Clock Hardware package, one sheet of #9560 Baltic birch plywood and optional #5009 Acrylic Plate separately. The #3189 clock package includes the pendulum clock movement with hands, the clock dial and turn buttons. Save by ordering the #6945 Polly Pendulum Special, which includes both the #W3513 Polly Pendulum Clock Plan and #3189 Clock Hardware. The AA battery, wood and wood finish are not included.